A new survey of consumer attitudes reported by the Federal Reserve Board affirms historically high satisfaction among those who purchase credit insurance and concludes that credit insurance purchasers believe they would be ill-served by any move to restrict credit insurance as an option when they borrow. The Survey Research Center of the University of Michigan surveyed 1,006 consumers during September and October 2001 for the Credit Research Center of the McDonough School of Business of Georgetown University using a questionnaire designed by Thomas A. Durkin, a member of the FRB’s Division of Research and Statistics. 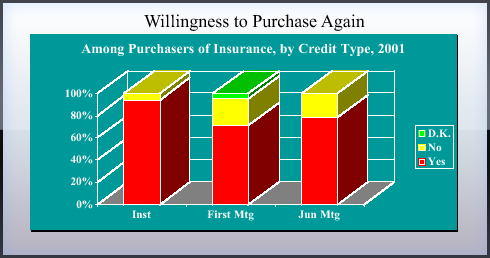 The survey confirms findings of earlier surveys, with up to 90 percent of credit insurance purchasers responding that they are satisfied with credit insurance and would purchase it again when borrowing, and shows again that consumers receive ample notice that credit insurance is a voluntary option to insure loans when they borrow. 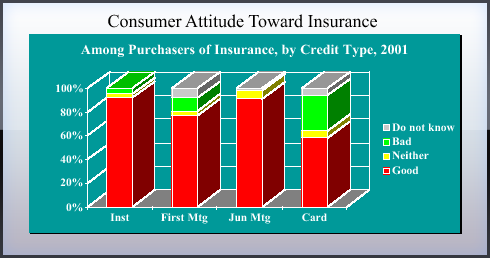 Results and analysis of the survey are reported in an article by Mr. Durkin entitled, “Consumers and Credit Disclosures: Credit Cards and Credit Insurance” that also examines a survey conducted during 2001 concerning consumer attitudes about the use of credit cards and credit disclosures under the FRB’s Regulation Z governing truth in lending. The Consumer Credit Industry Association (CCIA) has reviewed the findings and concluded the new study confirms the findings of every study conducted during the past 30 years in which consumer knowledge and attitudes about credit insurance has been tested. Uniformly the studies find that consumers value credit insurance, understand it, received ample notice that selection is voluntary, and said they would purchase this valuable financial protection again when they borrow. Among surveyed consumers more than 92 percent who purchased credit insurance to protect an installment loan reported a good opinion of the product with 90.4 percent saying they were very or somewhat satisfied. Among home equity borrowers 90.7 percent had a good opinion and 83 percent were very or somewhat satisfied. Among first mortgage borrowers who purchased credit insurance, 77 percent had a good opinion of the insurance and 82 percent said they were very or somewhat satisfied. The CCIA believes the findings of the study and the conclusions drawn from it in the analysis by Mr. Durkin should be a strong signal to legislators and regulators that credit insurance is an important consumer option. It is a strong signal that this option should be preserved in the insurance marketplace because consumers who purchase credit insurance do so knowingly, willingly, and with expectation that public policymakers will understand its importance for them. 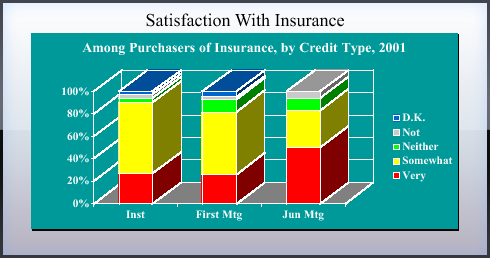 Further, the high satisfaction levels reported by credit insurance purchasers and their willingness to repurchase, including first and second mortgage and home equity borrowers, indicates that consumers who use and value credit insurance make no differentiation and have no concerns about whether they finance the insurance through payment of a single premium or as a monthly charge. A clear majority in all three categories said they would purchase credit insurance again when borrowing, including 94 percent of installment borrowers, almost 78 percent of equity borrowers, and 71 percent of first mortgage insurers. 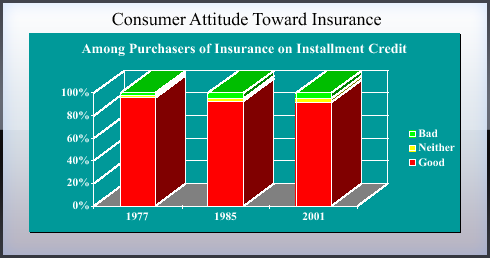 Previous landmark surveys and studies of consumer attitudes to credit insurance include a 1973 study by the Ohio University College of Business Administration, 1977 and 1978 surveys for the Board of Governors of the FRB, a 1986 study for the Federal Reserve Bank of San Francisco, and a 1993 study by Purdue University. There are four principal types of credit insurance: credit life, credit disability and credit property insurance, and involuntary unemployment insurance that respectively insure debt repayment in the event of death, accident or ill health, loss or damage to property, and involuntary loss of employment. Founded in 1951, the CCIA represents more than 140 credit insurers throughout the United States.